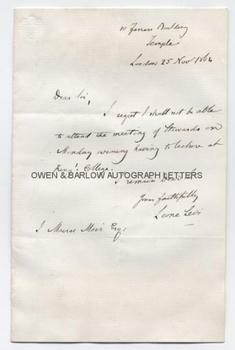 LEONE LEVI autograph letter Signed. British (Italian born, Jewish) statistician and economist. ALS. 1p plus integral blank leaf. 10 Ferrars Building, Temple, London. 25th November 1864. To J. Macrae Moir. 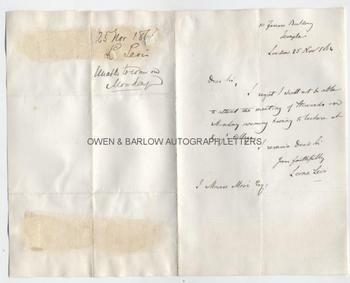 "I regret I shall not be able to attend the meeting of stewards on Monday evening having to lecture at King's College." 8vo. Approx 7 x 4.5 inches. 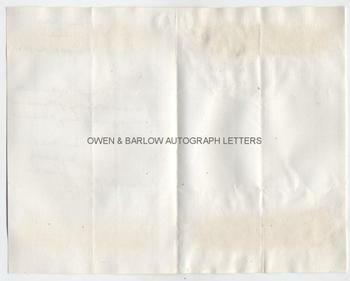 Docketed on verso and with slight mounting traces on verso of integral blank leaf. Leone Levi advocated and was instrumental in introducing local chambers of commerce and in 1849 founded the first of these, the Liverpool Chamber of Commerce, with himself as Secretary. In 1850 he published his Commercial Law of the World, the first comparative study of the mercantile laws and customs of the world's trading nations. He was a noted economist and statistician and was appointed to the chair of commercial law at King's College, London in 1852. Amongst his other innovations should be listed the introduction of evening classes for those who were unable to study full-time.